British archaeologists are currently excavating a 3000-year-old settlement so perfectly preserved that it's inspiring comparisons to Pompeii. The site includes pristine structural components from the buildings themselves as well as common household items like textiles, farming tools, and cooking supplies. 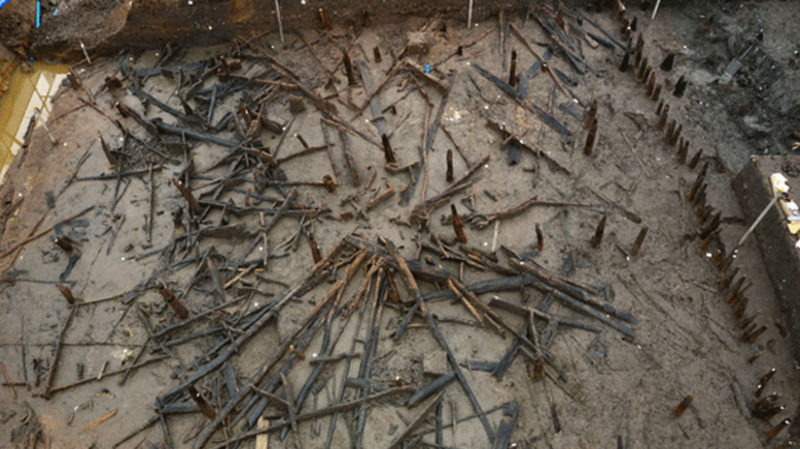 The discoveries are being considered the best-preserved Bronze Age dwellings ever uncovered in Britain. The settlement owes its impressive condition to the silt underlying Cambridgeshire’s marshy fens, where they were discovered. Originally suspended above a river by a series of stilts, the structures caught fire and collapsed into the water beneath them, where they remained preserved in the muck for millennia. The houses remained undisturbed until a local archaeologist noticed a series of wooden posts jutting out from the ground in 1999. This led to an initial evaluation of the site in 2004 followed by a more extensive one in 2006. The level of quality in the artifacts uncovered at that time proved that they had found something truly remarkable, and now a team from the Cambridge University Archaeological Unit is working on a full excavation of the site. In addition to everyday items, archaeologists have dug up objects that would have been considered precious for the time, including a bronze sickle and glass beads possibly belonging to a necklace. They even discovered what is likely the spine of a cow in one of the buildings, which could offer important insight into the diet of the marsh-dwelling community. Because there was no evidence that the people took advantage of the fish, eels, clams, or other food options locally available to them, it's possible that they settled in the area for power, rather than resources. Their proximity to the river—which would have been a major transportation hub at the time—may have been their key to wealth, status, and control. This hypothesis is supported by the variety of food and other valuables that have so far been uncovered on the site. A paper detailing the team's discoveries is expected to be released in a few years, after which the items will be displayed to the public.